1 oz Silvertowne Buffalo Silver Bar | ?? 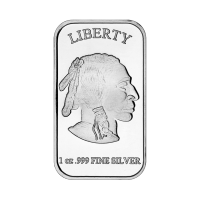 正面 The image of an Indian head with "Liberty" written above and "1 oz 999 fine silver" written below. 反面 A Buffalo withthe words "United States of America" written above and "In God We Trust" written below.